Enemy of the Daleks? Everyone? Is this about everyone? That's literally billions of people. Anywho, this involves the Seventh Doctor and Ace which is always a great combination. Let's see what it's about! "Bliss used to be a paradise planet. The Galapagos Islands of space. But when the TARDIS brings the Doctor, Ace and Hex to Bliss, it’s been over-run with ironweed plants, and the air is heavy with the stench of burnt silk and static electricity. This time, could it be the Daleks who need saving?" Could it be? I dunno, I haven't heard this yet. What did you think? What was the secret? Was it a good one? Are ironweed plants buildings or flowers? I need to know! Why is there always some professor/scientist making some evil race of creatures and bringing the daleks along? I mean, I feel like this story is a little overdone. Even so, still enjoyable to listen to. I really enjoy the 7th Doctor and Ace, so that always helps. Hex was only okay. I didn't really love him. I DID however love his accent. 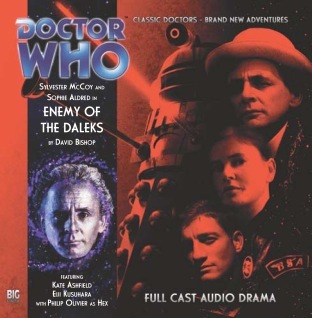 Once again, I like how Big Finish is playing upon the Seventh Doctor as a crafty, scheming Doctor. That was on the show and now a lot of his stories revolve around him keeping a secret from people. Him trying to fulfill the timeline and essentially save the Daleks was an interesting one. Just took a bit to get there because it's obvious these bug creatures weren't going to succeed in any fashion. It was fun to hear a direct callback to the key scene from Genesis.